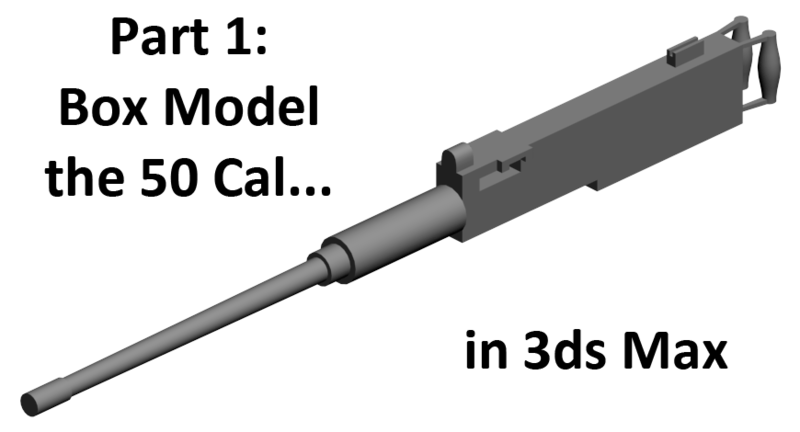 In this tutorial, we will model the gun. 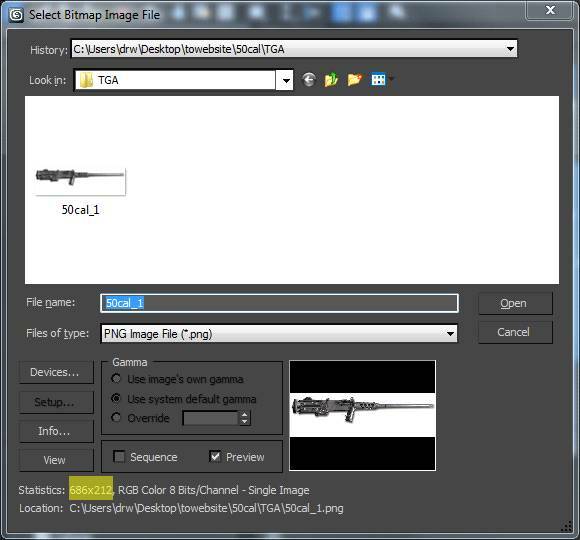 To start off, we create a Plane object and paste a background image of the gun on it. This will make it easy to model the gun. 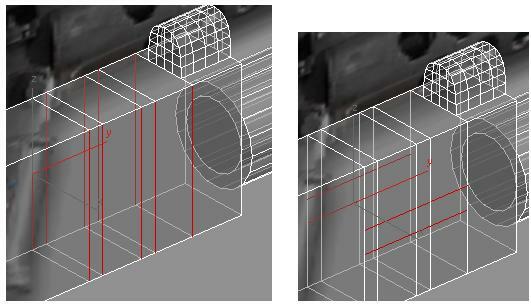 Then we draw the gun box, attach a cylinder to it, and convert it to an Editable Poly. 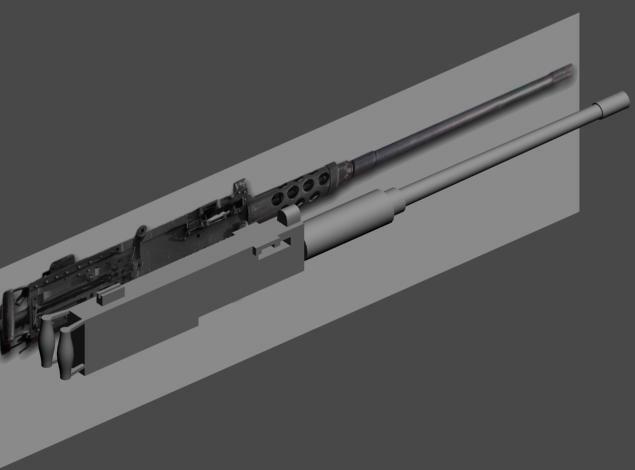 Then we use a few tools in 3ds Max to model the gun. Tools include Inset and Extrude, Connect, Detach and Attach, TurboSmooth, Scale, Clone, Bridge and Target Weld. Open your 3ds Max. 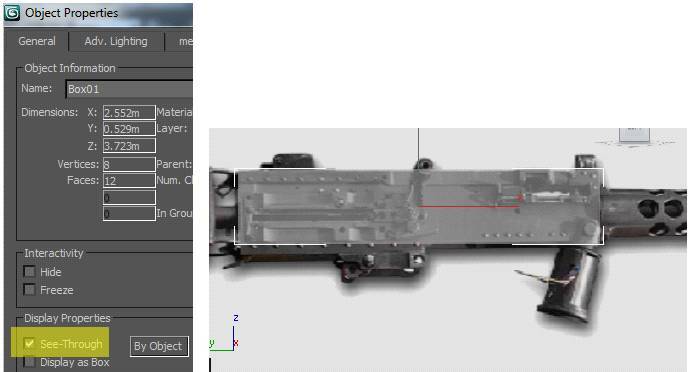 First, load Gun image on a Plane object. Create a Plane object in the Right viewport. 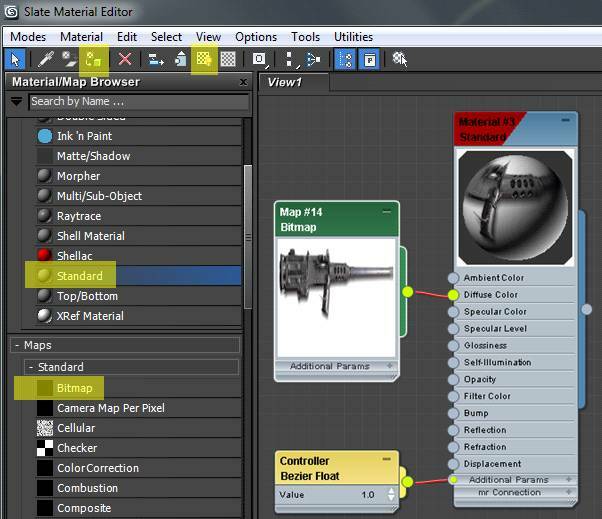 If you have the Slate Material Editor, create a Standard material, and a Bitmap that connects to the Diffuse node. 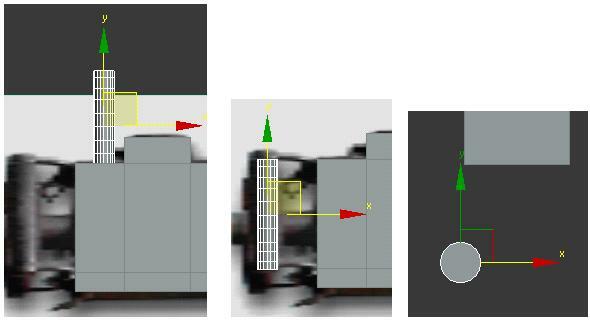 Load the 50Cal gun pic into the Bitmap. 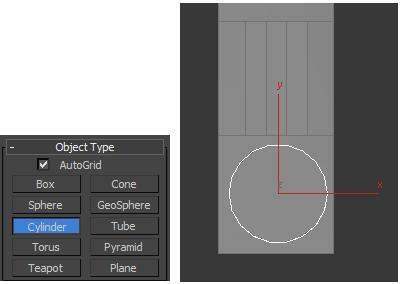 Then Assign the material to the Plane object. 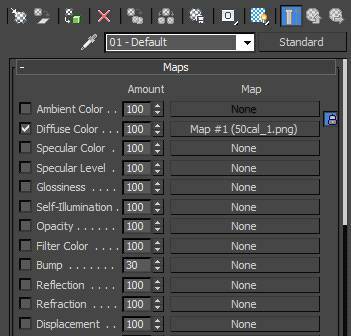 If you have an older 3ds Max, just use the Material slots and map rollout. When you load the picture, notice the yellow highlight. The Picture is 686×212 pixels. The plane has to be re-dimensioned. 686×212 pixels becomes: 6.86×2.12m. 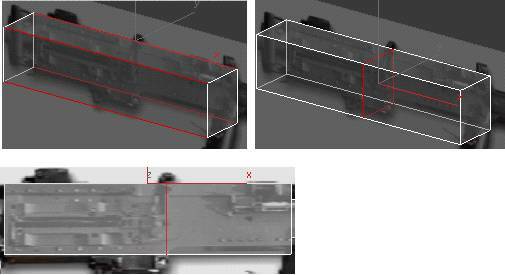 Now the picture on the Plane object is properly dimensioned. Click the Geometry button.Then checkmark AutoGrid. 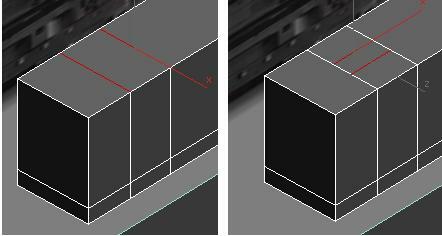 Click Box, and draw the box on the plane object, to match the size of the MG box in the background picture. Right click the box object and go to Dispay Properties, and check See-Through. This will make it transparent and easier to see the background detail as you model. Select just the box object. 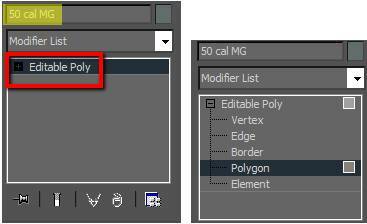 Right click the box and convert to Editable Poly. Name the box “50 cal MG”. Go to Polygon sub mode. Go to Polygon sub mode. 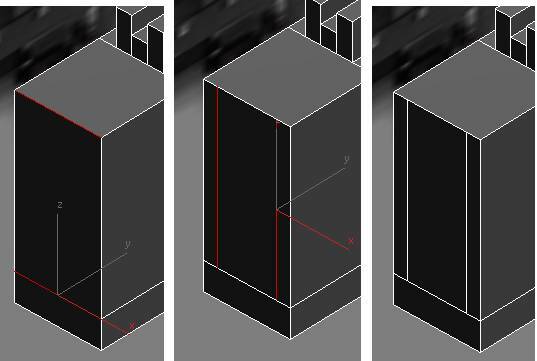 You can re-dimension the box by selecting the side poly’s and then moving them in Move Mode. In Edge mode. Select a ring of Edges on the main box. Under Edit Edges, go to Connect settings and add one segment. Slide the new edge loop to where the first half of the box should be smaller. Go back to Polygon mode, select the two bottom box poly’s. 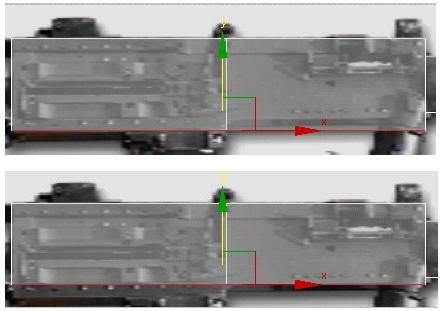 Then go to Move on the ToolBar and pull up on the Y axis as shown in the pictures. 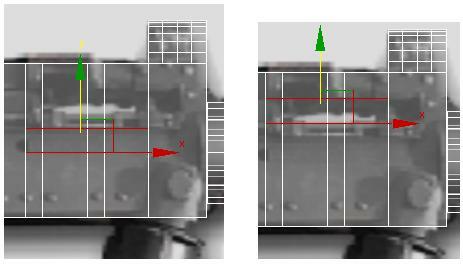 In Polygon mode select the shown poly. Then Extrude out to match the background. Click the Create Tab. Check AutoGrid. Click Cylinder. Under Parameters choose 18 sides. 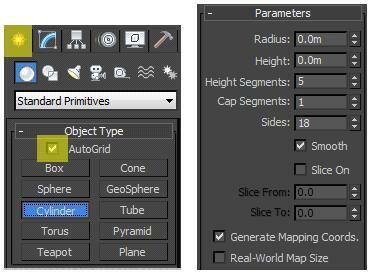 Create a Cylinder on the front box(AutoGrid makes this easy). 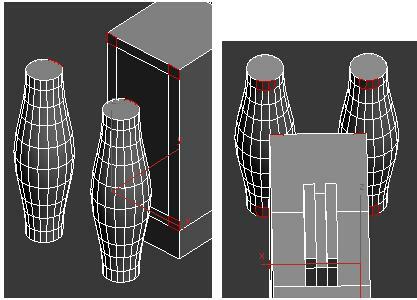 Then right click and convert the cylinder to an Editable Poly. This will be the gun barrels first segment. 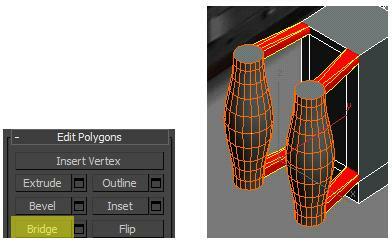 Go to Polygon mode, select the end Cylinder poly, then under Edit Polygons, click Inset. Drag your pointer over the red poly to Inset it. 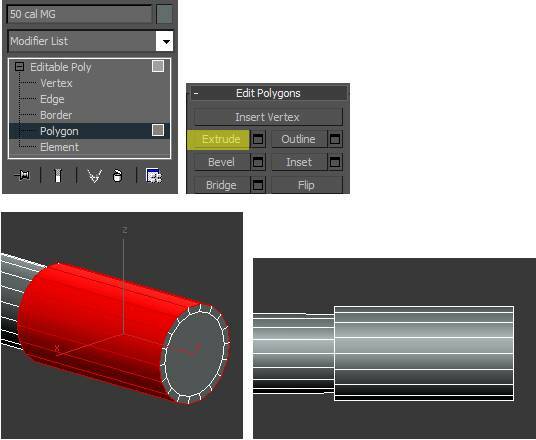 Under Edit Polygons, click Extrude and use your mouse pointer to pull out the selected poly until it reaches the end of the second barrel segment. Under Edit Polygons, click Inset. Create an inset poly again. Extrude the third barrel segment until you reach the start of the last barrel segment. Use the Scale button on the toolbar to taper the end. This is the last segment. Don’t inset… just Extrude. In Polygon mode select the poly’s at the end of the barrel. 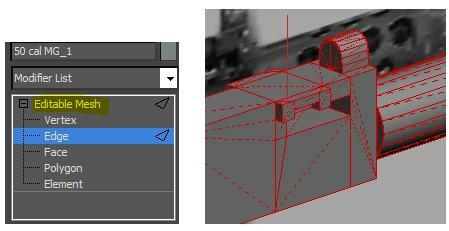 Under Edit Polygons, click the Extrude settings button. Choose Local Normal, and 0.024m height. Select the poly’s that are not in a Smoothing Group. Put them in an empty smoothing group. Once the barrel is done, select the gun box, Attach the barrel to the gun box. Group select the ring of edges below. Go to Connect and set it to 2 segments. Pinch and Slideuntil the edges line up in the background picture. Select the two edges you see below. Go to Connect and add 2 segments. Select the two edges below and go to Connect and add 2 Segments. In polygon mode select the polys you see below. Extrude the poly’s up. Then Extrude the middle poly up a bit. In Edge mode, select the four edges below. Go to Connect and add 1 segment. Slide = -73. In the image on the far left, select the 2 edges. Go to Connect and add 2 segments. 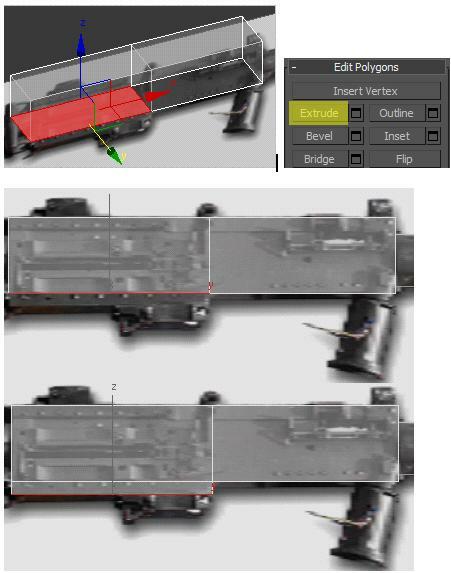 Go to Polygon mode and Extrude the forward gun sight poly up. Stay in Polygon mode. Group select all the front sight poly’s. Under Edit Geometry, click Detach. Name the object “Front Sight”. It is a separate object for now. Select the new object. Click the Select By Name button. Choose Front Sight. We want the front sight to be rounded with the TurboSmooth modifier, and to make use of the “Separate by Smoothing Groups“. 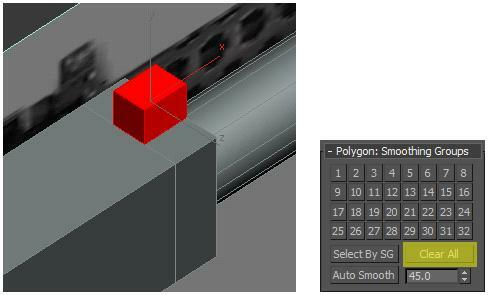 First, group select all poly’s, then under Smoothing Groups – Clear All. Add a TurboSmooth Modifier from the Modifier List. Iterations = 2. Check “Separate by Smoothing Groups”. Activate the 50 cal MG object. Click the Attach Button. Click the front gun sight. It becomes an Element of the Gun. In this picture, the gun box is thin, and the first segment of the barrel is wider than the box. In Polgon mode, group select all right side poly’s. 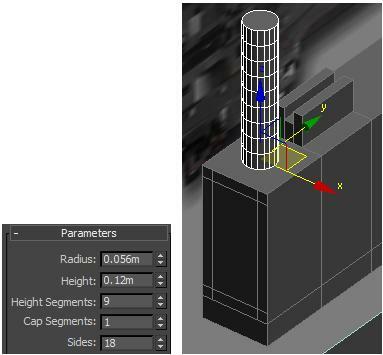 Go to Move on the toolbar, and on the X axis, in the Top viewport, move the poly selection to the left as seen below. Do the same thing to the left side poly’s. Select the two edges below, then go to Connect to make two new vertical edges.Pinch the new edges outwards. Select the four vertical edges, go to Connect, and add two horizontal edges. Pinch them outward too. Create a Cylinder with AutoGrid checked. Draw one in the Top viewport on the gun box. Adjust the Radius. Height segs = 9. Sides = 18. In the Side view, move the cylinder to fit the background image. In the Top viewport move it to the left. Go to the Scale button on the toolbar. 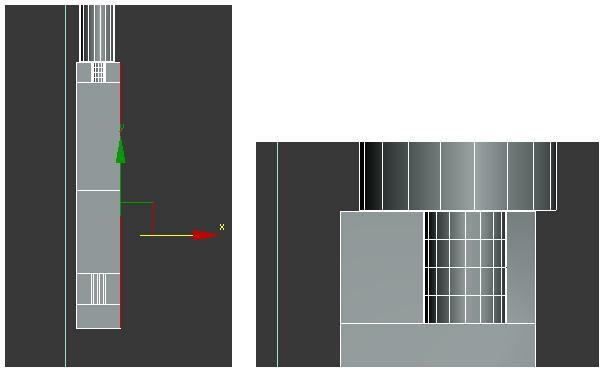 In the Top viewport, scale on both the X and Y axis. This will puff out the middle of the handle. Turn offSoft Selection. Hold the Shift key and Move the handle on the X axis to the right, to make a Clone copy of the cylinder. Click the gun box and Attach the cylinders. They are now part of the main object. 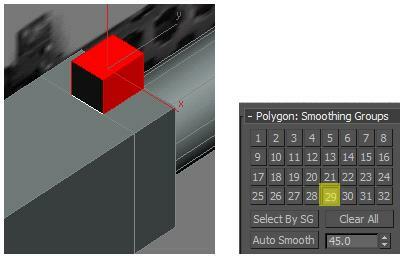 In Polygon mode, select the poly’s show below on both the box and handles. Under Edit Polygons, click Bridge. Now the handles are connected. Keep the Handle bar poly’s selected. Under Smoothing Groups, click Clear All. You do not want rectangular polys to smooth, or it looks distorted. Lets model the ammo hatch. Select a ring of four edges and go to Connect to add 4 segments. Turn on SeeThrough from the objects properties. Select and move each edge ring as shown below. Then select the 10 edges from both sides below. Go to Connect to add 2 segments. Pinch = -40. Move the 4 edges up to where the empty space in the box is dispayed in the background image. Select the 4 edges below (two on each side). Go to Connect and add 1 segment. Go to Polygon mode and select the shown poly’s below. Extrude the poly’s out a bit. These will be the ammo hatch handles. Select the poly’s below on both sides to make a cavity in the box. Go to Bridge, and the cavity is created. Turn off the object see-through in the objects Properties. 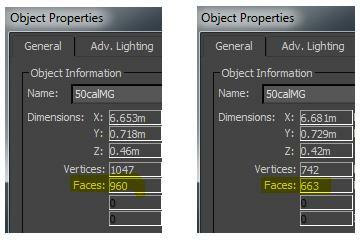 Optimize the model by bringing the poly(face) count down to a minimum. Go to Vertex mode and then click Target Weld. 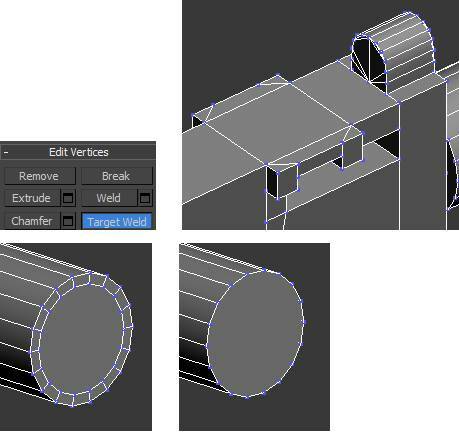 Weld all points that you can while preventing the 3D geometry from collapsing. If you convert the model to Editable Mesh, go to Edge mode and select the whole model, you will see that indeed all faces are 3 points. 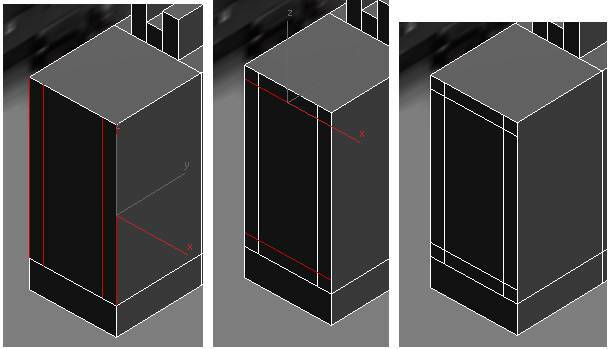 The diagonal lines of 4 point poly’s are hidden when modeling, because we usually do not need to see them. The model is finished. . In the next Tutorial, we will build a UVW Map of all the surface areas, and then export it as a bitmap. This bitmap will be for the texture maps that will add color and realistic detail to the model.